We talk with various guests who are in Washington, D.C., today for the 44th Annual March for Life about what the March means and what will be going on today. Katie Schuermann is an author of multiple novels and is marching with the LCMS group. Find her work at cph.org. Russell Gombosi, M.D., is a Pediatrician with American College of Pediatricians. Find them at acpeds.org. Deaconess Kim Bueltmann is Director of Campus Ministry for Concordia University Wisconsin, cuw.edu. Donna Harrison, M.D., is Executive Director of AAPLOG. Find them at aaplog.org. Rev. 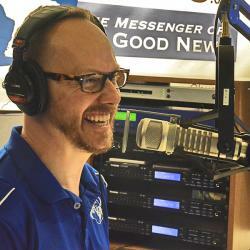 Michael Salemink is Executive Director of Lutherans for Life. Learn more at lutheransforlife.org. Listen to the full Faith & Family program from January 27, 2017, here. Thy Strong Word - Romans 14: "Do Not Pass Judgment on One Another"